A "saddle bag pouch" is draped over the patient's right thigh to conveniently place frequently used instruments such as monopolar spatula, scissors, bipolar forceps, graspers, blunt-tipped dissectors, needle holders, and suction-irrigation device. We find the monopolar spatula, set at 50 to 90 W pure cut, to be a very useful tool to enter the space of Retzius. It is used for dissection on its thin side and as small vessels come into the operating field, it is turned to the broad side for coagulation. We use Talon 90-degree self-righting needle holders with spring handlesb. A 0 polydioxone on a C-1 needlec is used for the four Burch sutures and the closure of the space of Retzius. If paravaginal sutures are needed, interrupted figure-of-eight 2.0 Prolene sutures are used. 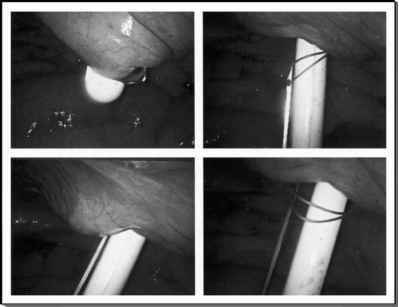 Four disposable trocarsd are used: 10-mm infraumbilical, 10-mm left lateral, 5-mm right lateral, and 5-mm suprapubic. The Inlet Closure Device®e is used to close all 10 -mm or greater trocar sites and any 5 mm site used for back loading needles. An open-ended knot pusher is used for extracorporeal knots.